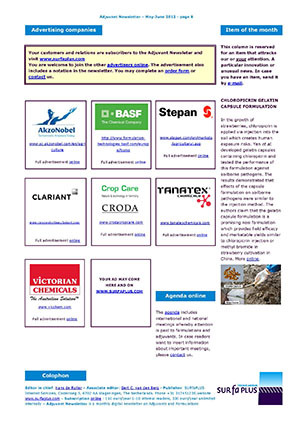 A great diversity of big and small companies altogether offer a wide range of in-can and tank-mix adjuvants for agrochemicals. SURfaPLUS Internet Services offers the adjuvant industry to present its products and services on this website. Click here for additional information and the online advertising order form. Advertisement packages 3.1 and 3.2 include promotion of the company's logo and website address in the Adjuvants & Formulations newsletter.